I love the Disney songs too! They're just so cute and catchy. very very beautiful dress and i love your necklace. you look really stunning … awesome. You look so beautiful, this dress is just adorable on you! What sweet inspiration! 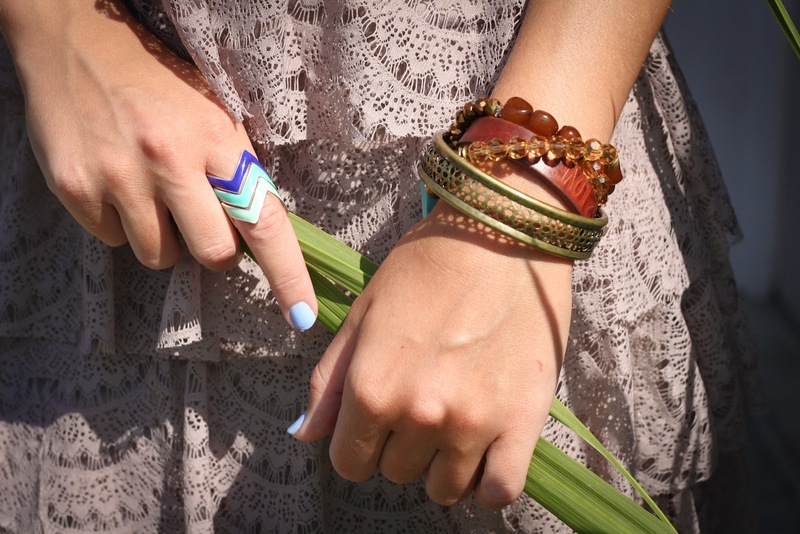 Love your stackable rings! along with the necklace- fab outfit! lovely outfit and totally in love with the sandals! You look so gorgeous!! Hope you are having a wonderful day! I love your dress and nail-colour! And I have the same, when I'm in the mood for it I look up some Disney-songs on YouTube and listen to them. Pretty dress and I love those rings! Also, essie's bikini so teeny has been my new favorite color this summer. I love it! This dress is too cute, love the frills! And the necklace is a nice pop of colour! haha yea this does look kind of pocahantas-esque! and i love it- especially the beading in your sandals. you look gorgeous! Lovely blog 🙂 I would love to see much of your post! May be we could follow each other. Let me know once you followed me in google friend connect and I will follow right back. love the ruffles on that dress, so cute. That is such a cute dress. You have fabulous hair too! oh i love your hair! i never manage to do them like that! kisses from your new follower! Your hair looks awesome here.